In the sound of the 1960s and 1970s, nothing symbolized the rift between black and white America better than the seemingly divided genres of country and soul. 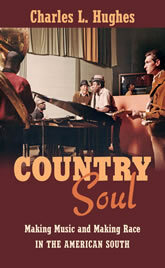 Yet the music emerged from the same songwriters, musicians, and producers in the recording studios of Memphis and Nashville, Tennessee, and Muscle Shoals, Alabama–what Charles L. Hughes calls the “country-soul triangle.” In legendary studios like Stax and FAME, integrated groups of musicians like Booker T. and the MGs and the Muscle Shoals Rhythm Section produced music that both challenged and reconfirmed racial divisions in the United States. Working with artists from Aretha Franklin to Willie Nelson, these musicians became crucial contributors to the era’s popular music and internationally recognized symbols of American racial politics in the turbulent years of civil rights protests, Black Power, and white backlash. Hughes offers a provocative reinterpretation of this key moment in American popular music and challenges the conventional wisdom about the racial politics of southern studios and the music that emerged from them. Drawing on interviews and rarely used archives, Hughes brings to life the daily world of session musicians, producers, and songwriters at the heart of the country and soul scenes. In doing so, he shows how the country-soul triangle gave birth to new ways of thinking about music, race, labor, and the South in this pivotal period.